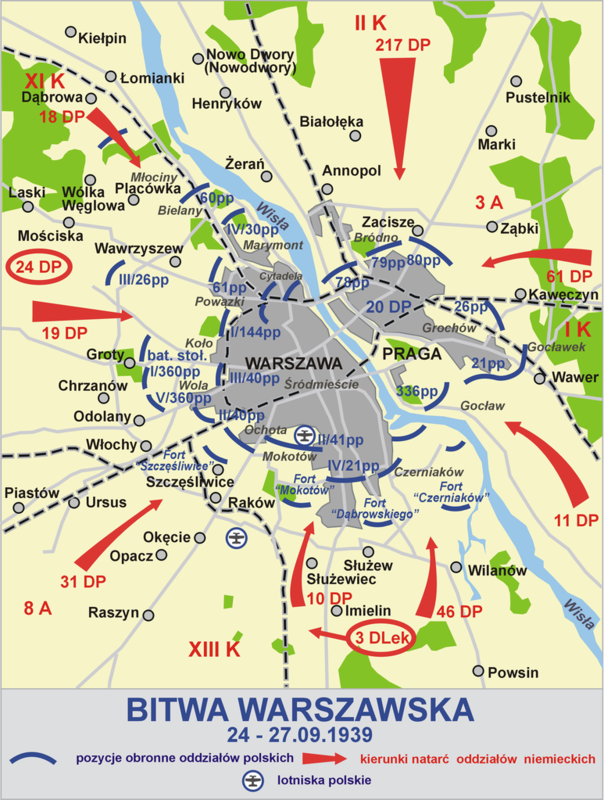 Map of the Battle of Warsaw. Germans-red, Poles-blue. By September 19 1939 – the day Hitler made his triumphal entry into Danzig – the campaign in Poland was essentially over. The war of movement had come to an end and the bulk of the Polish armies had been destroyed. Except for a few isolated pockets of resistance remaining on the Soviet border and on the Baltic coast, only Warsaw and Modlin were still holding out. The perimeter that linked the two strongholds was completely surrounded and – as the German General Staff told Hitler – their fall was now merely a matter of time. In mid-September, Hitler had personally intervened in the conduct of the campaign, not for military but for political reasons. Knowing the Soviets would soon invade Poland from the east, and that the agreed partition line between German and Soviet territory ran along the Vistula, he wished to make absolutely sure that Warsaw would fall before the Russians reached it, which was planned to happen on October 3. He therefore told his surprised generals that he wanted the city captured by September 30 at the latest. Rather than take it by a direct assault, he now chose to lay siege to the city and blast it into submission. He ordered von Rundstedt to assemble all his army group’s heavy artillery and mortars around the city and instructed Hermann Göring, the C-in-C of the Luftwaffe, to embark on a ruthless and all-out area bombing of the metropolis (Operation `Wasserkante’). The renewed aerial offensive began on the 13th when 183 Stukas and He 111s from Löhr’s Luftflotte 4 dropped their loads on the north-western part of Warsaw. The Jewish quarters were especially hard hit. The attacks continued on a daily basis, reaching a new crescendo on the 17th. Although the orders instructed the pilots to concentrate on strategic and military targets, such as the city’s water, gas and electricity works, military barracks, ammunition dumps, artillery positions and command centres (specifically the Citadel, the War Ministry and the General Inspectorate of the Army) and traffic hubs, in actuality the bombers and dive-bombers engaged in an indiscriminate area bombing, which by necessity led to massive collateral damage and thousands of civilian casualties. At the same time, German heavy and medium artillery, drawn up all around Warsaw under overall command of Generalmajor Johannes Zuckertort, began a ceaseless bombardment of the city, which added considerably to the damage and casualties. Every move in the Polish front line brought down a salvo of shells and mortar bombs and every crossroads was subjected to periods of concentrated fire. The heavy artillery included big railway guns, large-calibre siege guns and heavy mortars, one round of which could pulverise entire blocks of buildings. The civilian population lived permanently in a twilight of dust, acrid smoke and gloom of underground shelters. The atmosphere in the beleaguered city had now turned decidedly bleak. All the shops were closed, with windows barred. No street was without damage. Broken water mains spouted fountains into the air and the smell of bust sewage pipes pervaded every corner. Many buildings had their windows shattered and walls scarred with shrapnel. Rescue workers were digging in smoking ruins, searching for survivors. Most of the inhabitants looked shabby and tired, many of them with blood-soaked bandages and the light of desperation in their eyes. Every cellar, subway, ditch and trench had its civilian occupants. Even in the front line there were women and children who could not be sent away. The troops shared out their food and water but it was a great problem to produce enough for all. Hospitals overflowed with wounded and thousands lay on blankets on stone floors waiting for attention from overworked doctors. Drugs and other medical supplies were getting scarce. With water mains hit so often that it was impossible to get water, fires blazed throughout the night, providing markers for the enemy pilots. Buildings collapsed without warning and burning gas mains lit up the debris-littered streets. In the late afternoon of the 16th – shortly after General Rommel had refused the German demand for surrender and Colonel Sosabowski had sent back the German parliamentaire to his own lines – 12 Heinkel He 111s from I./KG4 dropped a million leaflets over Warsaw calling upon the civilian population to evacuate the city towards the east within 12 hours `in order to prevent useless bloodshed and the destruction of the city’. Loudspeaker vans, from positions close to the front line, blared out the same message. The dropping of leaflets was repeated on the 18th, 19th, 22nd and 24th. The only result of the whole action was an agreement that enabled the entire diplomatic corps and all foreign nationals to leave the city. The 178 diplomats and 1,200 other foreigners crossed the lines at Marki, north-east of Warsaw, during a temporary truce on the morning of the 21st – an event that German propaganda exploited to the full to demonstrate Germany’s goodwill. Meanwhile, there were outbursts of fierce fighting, mostly at night and mainly in the sector on the east bank of the Vistula. During the day, German machine guns sprayed the forward areas; the Polish guns mostly kept silent, unless they were certain of hitting a target, and many of the men slept in order to be fresh for night-fighting. Nearly every night, the Poles launched company-sized sallies against the German lines, or even regiment-sized break-out attempts to the east. On the 20th, the 11. Infanterie-Division repulsed one such attack, taking 100 prisoners. On September 22 forces of the 18. and 24. 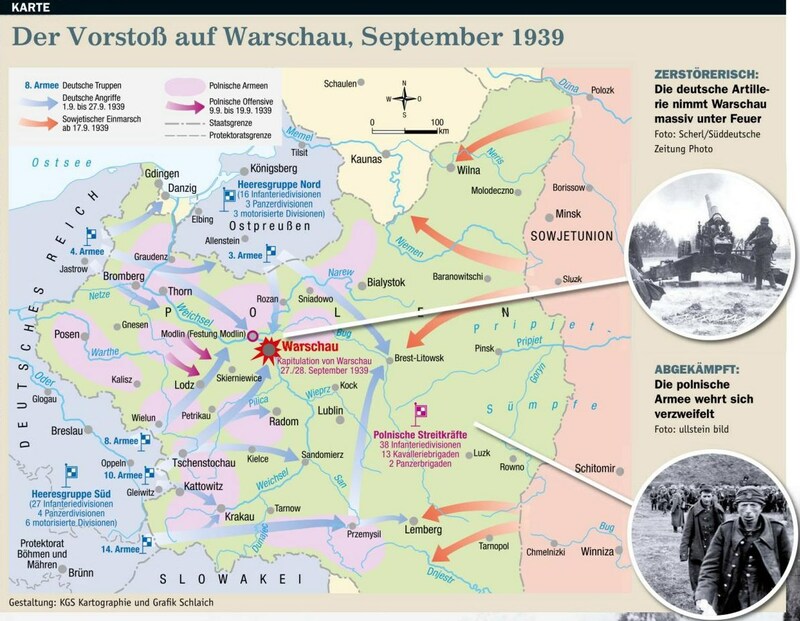 Infanterie-Division, attacking eastwards from the Kampinos Forest, reached the Vistula between Warsaw and Modlin, thereby cutting the last remaining lines of communication between the two strongholds and splitting the Polish perimeter into two separate cauldrons. Warsaw was now truly surrounded by a continuous ring of German troops. September 22 was also notable for a curious combat incident that happened on the German front line at Praga in eastern Warsaw. It involved Generaloberst Werner von Fritsch, the former Oberbefehlshaber des Heeres (Commander-in-Chief of the Army), who was killed by a Polish sniper while openly moving about in the forward areas of the 61. Division. Fritsch had been relieved of his post by Hitler in February 1938, the victim of false accusations of homosexuality levelled against him in the so-called Blom-Fritsch Affair. Though later cleared of all blame, his reputation and honour were irretrievably stained and it is pretty certain that Fritsch chose to inspect the Warsaw front lines, where he had no real business, in order to seek death deliberately. Meanwhile, everything was being readied for the final German assault on the besieged city. By now the forces surrounding Warsaw numbered eight divisions and some 175,000 soldiers. The plan was for a concentric attack by all divisions, with the main attack to be delivered by those of the XI. and XIII. Armeekorps from the west. On September 24, all German units, including those of the I. and II. Armeekorps of the 3. Armee east of the Vistula, were put under command of Blaskowitz’s 8. Armee, this to ensure good co-ordination in the forthcoming assault. Generalmajor Wolfram von Richthofen, the Fliegerführer z. b. V. in Luftflotte 4 (responsible for co-ordinating Stuka and other close-support operations), was put in overall command of the air formations deployed in the attack. The final assault began on September 25 – `Black Monday’ as it came to be known by the people of Warsaw. As part of the offensive, the Luftwaffe launched its largest bombing raid to date. Starting at 8 a. m., some 370 aircraft from Luftflotte 1 – 240 Stukas from five different Geschwader (StG 51, 76 and 77, and LG1 and 2), 100 Dornier Do 17 bombers from KG77 and 30 Junkers Ju-52 transport planes from IV./Kampfgeschwader z. b. V. 1 – unloaded an endless stream of bombs and incendiaries on the city. The Stukas and Dorniers could only drop bombs, not incendiaries, and Heinkels 111 were not available, so the Ju 52s were used to drop the phosphor bombs, both from their bomb racks and with dispatchers manually shoving the ordnance out of the open cargo doors. Rotating from their bases, with each crew flying three or four sorties, the 370 aircraft dropped a total of 500 tons of high-explosive bombs and 72 tons of incendiaries on the city. Warsaw became an inferno. The entire centre was badly damaged. In parts it was hardly possible to recognise streets as all the landmarks disappeared under the rubble. Columns of black smoke rose high above the city. For the Germans the air operation was a mixed success. The few remaining Polish anti-aircraft guns, firing off their last rounds, managed to shoot down two of the slow-moving Junkers. As the day went on, smoke from fires and large clouds of dust obscured targets and greatly reduced accuracy. As a result, a significant number of the bombs landed on German infantry positions in the north-west suburbs, leading to acrimonious discussions between Luftwaffe and Army commanders. Among those observing the bombing that day was Hitler himself. Ever since September 4, the Führer and his Führerhauptquartier retinue had been touring the Polish battleground, visiting command posts, meeting troops, inspecting destroyed Polish materiel and viewing battered fortifications. On the 22nd he had already observed besieged Warsaw from the balcony of the tower of a race and sports stadium overlooking Praga in the 3. Armee sector, but today his schedule included a visit to the 8. Armee west of the city, timed to coincide with the start of the final assault and the culmination of the aerial and artillery bombardment of the beleaguered city. Using trench binoculars, Hitler and his entourage observed the bombing and shelling, watching the columns of smoke billowing up from the built-up area. Meanwhile, the German land assault was underway. Starting at dawn, five infantry divisions assailed the western half of the city – anti-clockwise from north to south the 18. and 19. Infanterie-Division (under XI. Armeekorps) and the 31., 10. and 46. Infanterie-Division (under XIII. Armeekorps). The offensive was supported by 70 batteries of field artillery, 80 batteries of heavy artillery and the entire available Stuka and closesupport capability of Luftflotten 1 and 4. The initial attacks focused on capturing the various 19th-century forts that ringed the city and formed the outer core of the Polish defences. Each was to be tackled by assault teams of infantry and engineers equipped with ladders, pontoons, flame-throwers and explosive charges. In the 18. Division sector, teams from Infanterie-Regiment 51 and Pionier-Bataillon 48 managed to take Fort I (Mlociny) but failed to take Fort II (Wawrzyszew). In the 19. Division zone, Infanterie-Regiment 74 succeeded in taking possession of Fort III (Blizne) but the attack against Fort IIa (Babice) by Infanterie-Regiment 73 was repulsed with heavy casualties. In the 10. Division area, after a two-hour fight, assault teams from Infanterie-Regiment 20 and Pionier-Bataillon 10 seized Fort Mokotow, one of the city’s inner ring of fortifications, taking 269 prisoners. Further to the right, in the 46. Division sector, InfanterieRegiment 42 and Pionier-Bataillon 62, after an initial setback, captured Fort Pilsudski, another of the inner forts. Although four key forts had now been captured, the Germans were unable to push on across the open ground beyond and nowhere the attacking forces made much headway. By evening all attacks were halted, to be resumed the following morning. During the night, the Polish forces counter-attacked and managed to destroy several German outposts, especially in Mokotow in the south and Praga in the east. The story was much the same on the 26th. Again three of the forts were taken. The 18. Division in its second attempt managed to capture Fort II and the 19. Division grabbed hold of Fort IIa. In the 46. Division zone, Infanterie-Regiment 72 together with assault engineers of Pionier-Bataillon 88, after a bitter and prolonged fight, took possession of Fort IX (Dabrowskiego) at Czerniakow, taking 475 prisoners. Everywhere, the Polish garrison fought back with great courage and determination, and German progress remained slow, gains being measured in just a few hundred metres. Casualties were heavy on both sides. Despite having held off and slowed down the first blows of the offensive, the situation for the Polish commanders in Warsaw was now clearly and utterly hopeless. Although the garrison was still sufficiently strong in manpower to defend the city for several more weeks, it was only a question of time before their ammunition, rations and supplies would run out. Worse, the plight of the capital’s civilian population had become completely intolerable. The constant bombardment had resulted in heavy and mounting casualties. The destruction of the waterworks had caused a lack of both drinking water and water with which to extinguish the many fires raging all over the city. There was a lack of food and medical supplies and the hospitals were overtaxed by thousands of wounded soldiers and civilians. Irrespective of all that, strategically, the lack of support from the Western Allies, and the Soviet Union’s entry into the war, had made any further defence of the city completely pointless. In the late afternoon of the 26th General Rommel called a `council of defence’ to discuss the situation. Among those attending were Mayor Starzynski and Generals Kutrzeba, Czuma, Zulauf, Alter and Abraham. After listening to each participant’s views, Rommel announced his decision to open surrender negotiations with the Germans. All agreed and General Kutrzeba was appointed head of the parliamentary delegation. Early on the morning of September 27 Kutrzeba and Colonel Aleksander Praglowski, Rommel’s Chief-of-Staff, crossed the German lines to begin the capitulation talks. At 9.30 a. m. they met with General Blaskowitz. Many German units, as soon as news of the surrender talks reached them, immediately stopped their attack operations. At noon a cease-fire agreement was signed and all fighting halted. On September 29 all Polish units were to lay down their arms in specified areas; disarmed units were to gather in indicated areas; barricades, road-blocks and trenches on the main roads were to be destroyed and mines removed; units were to march out of Warsaw along certain routes according to a programme, under their own officers; privates and NCOs were to be released from prisoner of war camps and returned home after a few days; officers were to go to POW camps but to retain their sabres; officers not surrendering would, on capture, be treated as criminals and not accorded rights under the Geneva Convention; and troops were to carry enough food for three days. Several of the Polish units declined to put down their weapons and stop firing, and their commanding officers had to be visited by Generals Czuma and Rommel personally. Many units chose to hide or destroy their heavy armament rather than surrender it. The few remaining 7-TP tanks were destroyed by their crews. (Some of the hidden war material would later be used during the Warsaw Uprising of August 1944). At 6 p.m. on September 29 the evacuation of Polish forces to German prisoner of war camps started. It continued all day on the 30th. The following day, October 1, German units entered the city. The battle for Warsaw was over.